Luckily for you, we're having a Halloween at SMB Books! Ten percent off our already-low prices. Check out the bargains now. And don't limit yourself to audio programs - everything on the site is on sale. Just use the code Oct2012. Remember: You get an extra 10% at time of checkout. Discover the roadmap to successfully selling I.T. solutions and Managed Services! We realize from first-hand experience how difficult it can be to consistently close sales opportunities. - How many cold prospects have you converted into paying clients recently? - How many opportunities that were not referrals have you pitched and come up empty handed? - Wouldn’t you like to learn how to shorten your sales cycles and get more I.T. Solutions and Managed Services Agreements sold? While the presentation is geared toward small self publishers, 99% of the content is perfectly suited to anyone who is interested in promoting their products on the internet. Includes 25 minutes of Question/Answer, most of which is related to Internet marketing. The Story: A few years ago Karl put on his Network Documentation seminar in Redmond, WA. More than 100 were registered. The feedback from the seminar has been great. If you missed it, you'll want to order this CD right now! If you attended this seminar, you know you want to hear the information again on audio CD. We discuss 14 Sure-Fire Ways to make money via documentation. Audio program with slides. Includes two MP3 audio files and two slide decks in pdf format. All delivered in one zip file. 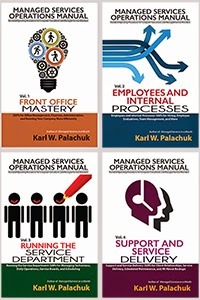 Karl Palachuk on Project Management and Zero Downtime Migration Strategies. 2 hours of solid information! Learn about the best tools and services to combine in your cloud service offering. This all-day program includes four sessions with slide decks and related handouts. We focus entirely on moving into cloud services AND making money while doing it. We give you a blueprint for making money in cloud services with the latest offerings from cloud service providers, hosting companies, and server vendors. Designing and Selling Cloud Services into the 1-20 Desktop Environment - Audio program with the PowerPoint slides in pdf format. Includes one MP3 audio file, one PowerPoint slide deckand one client-facing advertising example. All delivered in one zip file. Learn how you can take your share of the market - a market with 14.4 million businesses in the United States! Learn the strongest attraction for cloud services, and see how you can create products and services designed specifically to address what your prospects are looking for. This great little book does a lot more than give you sample agreements. Karl starts out with a discussion of how you run your business and the kinds of clients you want to have. The combination of these -- defining yourself and defining your clients -- is the basis for your service agreements. Everyone knows it - spoken agreements aren't worth the paper they re written on. The SMB Consultant is facing changes we never imagined a few years ago. Managed services are everywhere. Franchised tech support is taking off. And now big corporations are trying to compete in the SMB Space. Whether you like it or not, you need to make some changes in order to meet the challenges of the next few years. Service agreements literally define your business. If you re not using them, you need to start today. 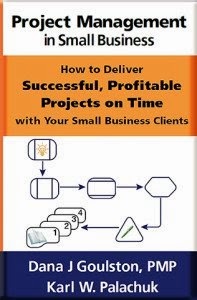 Perfect Profitable Projects - Audio program by Karl W. Palachuk and Matt Makowicz. Two audio CDs -- one great seminar! Includes all the PowerPoint slides, plus additional handouts. "Thanks Karl! Awesome Seminar! I listened to it all last night and this will change the way I sale and implement projects. You are the man!" On Time Technology Solutions, Inc. If you want to get started with Virtualization, there's never been a better time. In this informative training course, learn from Karl W. Palachuk and Dave Sobel -- Two virtualization experts who run their own businesses with virtual environments and have sold hundreds of thousands of dollars worth of virtual solutions. 4-hour seminar on 2 DVDs. Audio-only seminar on 2 CDs. SMB Online Conference 2012 - Audio training - 18 hours of training - plus more! Thank you for checking out SMB Books - Remember, the sale ends at the end of October!